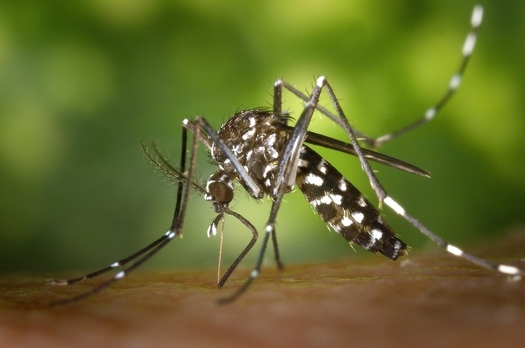 Mosquitoes can carry and spread diseases like encephalitis and West Nile Virus to humans. Lorain County Public Health (LCPH) has a comprehensive mosquito control program that helps stop the spread of disease. LCPH educates the public, tests mosquitoes for disease, treats for mosquito larvae, and sprays for adult mosquitoes. LCPH traps mosquitoes throughout Lorain County. Then, LCPH sends them to the Ohio Department of Health Laboratory to test for viruses like West Nile. LCPH sprays mosquito larvae to keep them from turning into adult mosquitoes that may spread disease. LCPH sprays standing water with environmentally friendly larval control products. LCPH sprays for adult mosquitoes when they are most likely to spread disease. We spray in residential areas to protect people at home. We use ultra low-volume mist spray equipment with environmentally responsible and safe adulticide spray. For more information on the LCPH mosquito control program, contact us at 440-322-6367.